With many financial institutions still using labourious and time consuming manual processes for managing payments, automation systems and smart solutions are a hot topic. Globalization has enhanced the need for cross-border/cross-currency payments, and a rise in technical capabilities means that your customers now also have higher expectations for the speed, efficiency, and simplicity of payments transactions. A coffee shop in Canada needs to buy beans from Ethiopia, a father in France needs to send money to his daughter studying abroad in Japan, or a consumer in Brazil wants to buy a gadget from a start-up in South Africa. 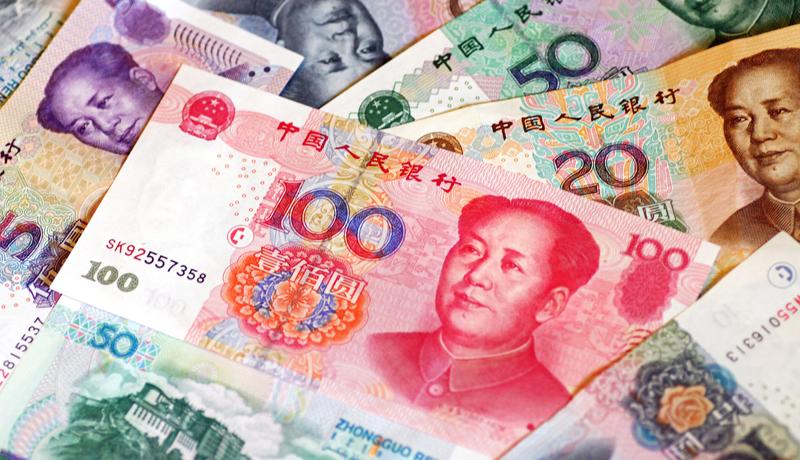 As individuals and organizations alike turn to financial institutions to process their cross-border payments, financial institutions (FIs) are feeling the pressure to deliver payment experiences that are streamlined, where a seamless experience takes place with the complexities of the backend checks and balances hidden from view. Not only must they differentiate against competing FIs for business, but they also risk losing market share to new FinTech players as they bring a more innovative approach to payments to the market. Within the evolving landscape, banks, corporates, and even FinTechs are challenged to differentiate offerings, while also ensuring that their core payments processes situate (or at least don’t limit) them for further growth while, at the same time, being flexible enough to respond to a more dynamic market. Headquartered in Warsaw, mBank S.A., one of Poland’s largest and fastest growing banks was facing these kinds of challenges. As one of the largest remitters of payments in Poland improvement was needed. As an example, mBank’s operational centre was finding it challenging to book payments –quickly and effectively as they were using a manual process when searching on routing information. This labour-intensive approach was costing valuable time and resources and did not match mBank’s ambition to grow their volume of payments processed and to increase their customer base (including financial institutions). mBank also needed to enhance their customers’ user experience when interacting with front-end payment submission channels. After careful evaluation of the issues, mBank chose the Accuity Global Payment File-Plus (GPF-Plus) product and employed it across their corporate and retail businesses. GPF-Plus is a data file containing global payment routing information, incorporating data elements such as National Clearing Codes, BICs, SSIs, and Clearing System Mechanism connectivity. Integrating the Accuity GPF-Plus database into its core banking system means mBank can now validate payment information provided by customers within its electronic banking systems, as well as enriching each payment with routing information based on a beneficiary bank’s BIC code. This automatically releases payments on the bank’s side and returns the status to the customer online through the internet banking system, providing straight through processing (STP), and an end-to-end process. Enhanced Product Capability – payments are now being processed faster and more efficiently in STP formula (more than 99% of outgoing international payments now proceed automatically), meaning mBank S.A. can offer customers a better quality product at a lower cost. Improved Operational Efficiency – mBank S.A. previously had to dedicate a team of 10 people to manually look up the correct data to process payments, but the new system is completely automated, meaning the team can focus on additional projects and tasks. Facilitated Increased Transaction Volumes – GPFPlus has enabled mBank to automate over 135,000 of its outgoing cross-border payments per year, contributing to an increase in customers and a 10% rise in the bank’s total volume of transactions. Mitigated Operational Risk – the implemented solution based on the Accuitys GPF-Plus database has significantly reduced the window for human errors when manually searching for information. Investment Returned in Full – mBank S.A. has saved around 1,200,000 PLN (roughly 300,000 USD) annually on operational costs, fully returning its IT (CAPEX and OPEX) investment within the first year of the GPF-Plus solution being implemented. 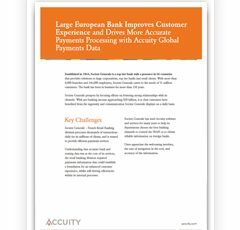 With Accuity, mBank S.A. is now a market leader in Poland by using the most accurate, reliable and up-to-date financial institution and routing information available, while addressing its operational efficiency challenges with a fully automated solution. mBank continues to realise benefits from using the GPF-Plus database and moving forward in partnership with Accuity they are continually looking at other ways to improve their payment procedures and in an ever turbulent payments environment. mBank looks set to continue supporting their customers experience through the enhanced accuracy and speed of their payments processing. 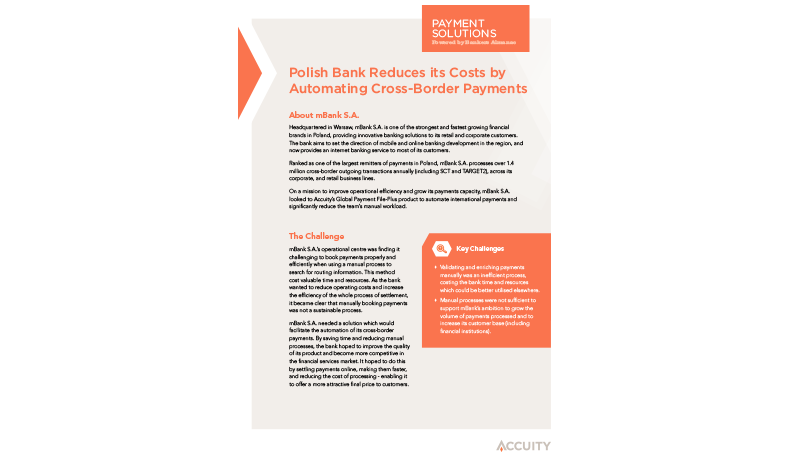 Polish bank reduces its costs by automating cross-border payments.